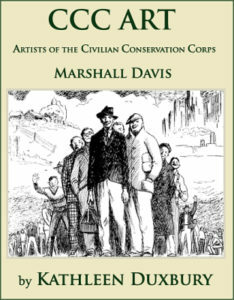 Marshall Davis was a young, untried and struggling artist caught up in a dramatic and timely turn of events. It was the Great Depression, his only option for a job was to enroll in the Civilian Conservation Corps (CCC) as a laborer. Davis wisely brought along his sketchpad and pencils and embarked on a artistic journey that would change his life and our understanding of the three C’s. Through the discovery of his masterful and whimsical illustrations, letters and records we are provided with a true visual of the real CCC. The CCC was the first and most successful of the New Deal work programs; a massive movement that is recognized as the greatest conservation effort in US history. One can easily sense the excitement felt by junior Civilian Conservation Corps (CCC) enrollee Marshall Davis on March 24, 1934 as he put pen to paper and wrote those words to Edward Rowan in the Treasury Department Washington, D.C. Marshall Davis was about to join the first of the government art programs, the Public Works of Art Project (PWAP). his assignment was to make a pictorial record of the CCC, a program his knew well.